As the black sheep of my family, it was with tremendous excitement that I bucked the trend of QIT/QUT enrolment and was accepted into a dual Bachelors of Science and Business at the University of Queensland’s St Lucia campus in 2000. The late 90s and early 2000s was a period of intriguing redefinition for UQ and young adults in general. The activism of the 60s and 70s had faded, the cultural blunderbuss of the 80s had left us in tatters, and the e-social boom of the 2000s had not yet begun. The hardest decisions we millennials faced were which refectory was the closest and how many floppy discs did one need per assignment as, invariably, three or four of them would be corrupted. Armed with a Nokia 3210 and $3 all day parking (I remember penning a strongly worded letter to the parking faculty when it jumped from $2.50), UQ was my arena of personal discovery and challenge. I believe we were less socially aware than our predecessors but more environmentally conscious, and the direction of UQ at that time followed suit—or at least, they seemed more concerned about the welfare of the monstrosities that governed the UQ lakes. This period also saw the burgeoning of the ‘institutes’, with the Institute for Molecular Biosciegnce (IMB) kick-started as a joint venture between UQ, CSIRO and the Queensland State Government, followed closely by the Australian Institute of Bioengineering and Nanotechnology and the Brain Institute. Although a lazy undergraduate student, I badgered my way into an honours degree in 2005 at the IMB with Doctors Fiona Simpson and Carol Wicking and discovered my first vocational passion, research. The IMB is a beautiful facility with exceptional staff; in 10 months of honours studies I had learnt more about the scientific method, discovery, and critical thinking than the previous 23 years combined. The only issue I had with the IMB, like other UQ institutes, is that it is a gated community and, while attracting great students, is diminished by lack of contact with the wider community. Admittedly I did enjoy the focus of bench work and avoided UV contact for years. Bewildered and confused in 2006, I engaged in a doctorate of Molecular Bioscience (I’m still not 100% on what exactly that is) with Professor Rob Parton. Being surrounded by hardworking and intelligent people sharpened my resolve to heap effort into my research, and in 2010 I was lucky enough to end up with a Dean’s Commendation for my thesis. I fell in love with my project and continued to work as a postdoctoral officer for another three years in the same lab. Presciently, or at least hedonistically, I also started mucking about with homebrewed beer during my PhD, as a hobby. In 2013, a once in my lifetime opportunity presented itself. My parents sold their not-so-small business and were looking to invest in something different. Although I was far better at drinking beer than making it, my parents and some close friends suggested we have a crack at a microbrewery. That was the birth of Newstead Brewing Co., of which I am a brewer and director. Leaving UQ and the IMB was a significant decision, especially after we were granted funding and students for the project. But UQ will always have a fond place in my memory, one that still impacts my choices today. 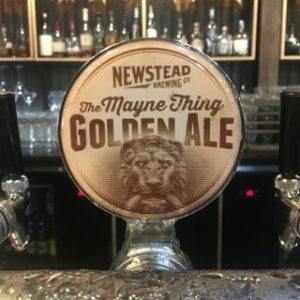 I named our golden ale ‘The Mayne Thing’ after the Mayne family, a nod to many an exam in Mayne Hall that I would have appreciated a Golden Ale or two to get through. Newstead Brewing is also partnering with UQ to sponsor a PhD project focused on Brisbane based yeasts and their uses in brewing. The UQ is a pillar of the Brisbane community, rich in history, diversity and exploration and it is a privilege to be partnering with it after working for it for two decades. Graduate Diploma of Research Commercialisation 2008, PhD in Molecular Bioscience 2010. Please note: The opinions expressed in each of the stories shared by individuals on this website are those of the individual author. This entry was posted in Family and tagged 2000s, brewing, Family, IMB, kick-start, mayne, millenial, newstead, parking, PhD, research, Science. Bookmark the permalink.